Hideki Nagaishi: What was the story of establishing STUDIO 4°C after finishing Kiki’s Delivery Service? Eiko Tanaka: Around the time we made My Neighbor Totoro, there were very talented freelance creators who were called Eiga-Gyokai Free*1 in the Japanese animation industry. And they were always gathered for making a film every time a new animated feature project started. There was only one animated feature film project every one or two years in Japan at that time. If the Eiga-Gyokai Free take part in an animated TV series project after they completed a film project, they cannot go back to freelancing until the TV series project completes. So, there is a risk that they cannot take part in a new film project when it commences if they are currently working for a TV series. Therefore, there is going to be a long period of unemployment between the end of one film project and a start of another new film project. The Eiga-Gyokai Free were turned adrift for a while after the My Neighbor Totoro project finished. So, some creators from the production team of My Neighbor Totoro made a group called “Studio NEKONOTE” within Studio Ghibli. A feature film, AKIRA (1988), directed by Katsuhiro Otomo, was in development at that time, so creators from Studio NEKONOTE helped out in that film. Then, when the film project Kiki’s Delivery Service started, the chief development staff of AKIRA joined the development team of Kiki’s Delivery Service, which consisted of the re-grouped chief development staff of My Neighbor Totoro. So fortunately, we could have really great talents for Kiki’s Delivery Service. Actually, Hayao Miyazaki says “I can’t create any more. I retire from making films” every time he finished a film project (laughs), and he said he will retire when he completed Kiki’s Delivery Service as well. At that time, I established STUDIO 4°C to reply to the request from some of the Eiga-Gyokai Free who worked for Kiki’s Delivery Service. The founding member of STUDIO 4°C consisted of three people: Koji Morimoto (the assistant animation director of AKIRA), Yoshiharu Satou (the animation director of My Neighbor Totoro), and myself. It was more like a group of around ten creators than a general animation studio. *1: Eiga-Gyokai: A Japanese term meaning “the film industry”. Hideki Nagaishi: Could we hear about the history of STUDIO 4°C so far, in brief? Eiko Tanaka: Around the time we established STUDIO 4°C, Katsuhiro Otomo was thinking, “Even though there are a lot of great young creators, there are few opportunities for them to use and show their talents. So, I would like to give them the chance.” Then an anthology film project was planned, titled MEMORIES (1995), which consists of three short films from young artists, with Mr. Otomo as the general director. At first, it was decided that Koji Morimoto would direct one of them, titled Magnetic Rose, and STUDIO 4°C would make it. But, eventually, STUDIO 4°C developed all three short films for a number of reasons. So, it was the first big project for STUDIO 4°C. The film project, MEMORIES, was a severely difficult task to accomplish, which was on the same level of difficulty as My Neighbor Totoro and Kiki’s Delivery Service, so I was losing my health overworking many times during the project. Katsuhiro Otomo saw my hardship and said to me, “MEMORIES was a very difficult film project, so I will plan a little simpler and easier-to-manage project for you, Ms. Tanaka”, and planned the film project Steamboy (2004). However, developing the scenario of Steamboy took a long time because it was an original story, not based on anything else. Then, we started discussing on making a new animated feature titled Spriggan (1998) with the staff of Steamboy, welcoming Hirotsugu Kawasaki as the director*2. We eventually completed the film whilst the Steamboy project was still in the planning stage (laughs). BANDAI VISUAL CO., LTD. took over the production of Steamboy from us and SUNRISE Inc. (one of the leading animation studios in Japan, now and at that time) completed the animation. So, STUDIO 4°C animated only the initial part of the film. The film STUDIO 4°C made after Spriggan is Princess Arete (2001), directed by Sunao Katabuchi. I started developing the film project together with Mr. Katabuchi when STUDIO 4°C was working on the two film projects, Steamboy and Spriggan simultaneously, so I went through successive hardships indeed at that time. *2: Mr. Kawasaki was the animation director of Stink Bomb, one of the short films in MEMORIES, and he was also in the team of Steamboy then. Hideki Nagaishi: Some projects were ongoing at the same time during a short term, and all of them were featured film projects, weren’t they? Eiko Tanaka: Yes, that’s right. 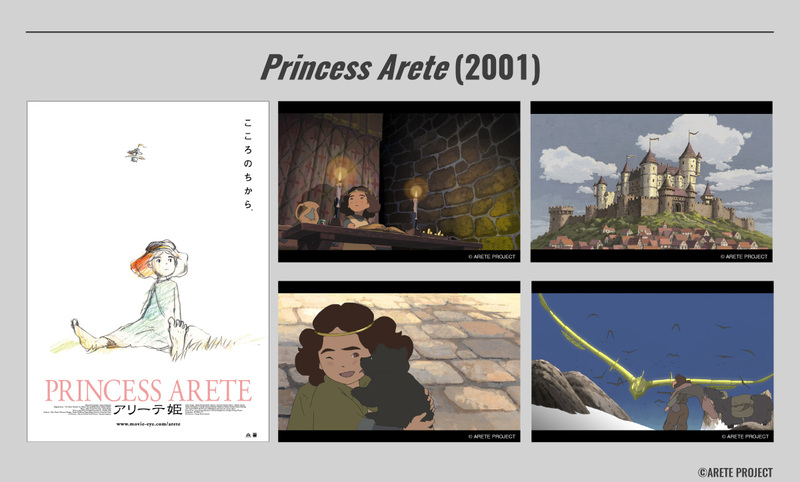 The original story of the film Princess Arete was written by a teacher of a primary school in the UK who advocated feminism. I, as a woman, started the project to make an animation for women only by women at first. But after that, I faced the question, “Would embodying the true meaning of feminism in this project entail ostracizing men from the team?” While thinking through this question, Sunao Katabuchi, who is male, took part in the project, and I chose him to be the director, overcoming my own question. I discussed with him over and over, and then we decided to propose a new vision of the princess different from Disney princesses such as in Cinderella (1950) and Sleeping Beauty (1959). In these films, only their beauty is drawn as their status. But it would be good to have an animation of a princess story that doesn’t focus on the beauty of the princess. We should have a vision of a vigorous princess who carves her own path with her own will, like Princess Arete. So, we suggested this idea of a princess from the viewpoints of women through this film. 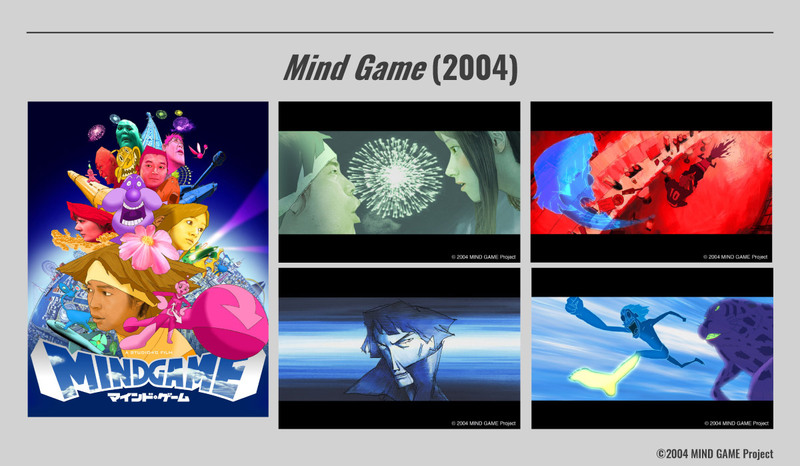 Hideki Nagaishi: STUDIO 4°C developed Mind Game (2004) after Princess Arete. How did the film project take place? Eiko Tanaka: I came across the original Manga and loved it, and I thought it was very interesting and attractive! So, I tried to meet the author Robin Nishi personally. However, it was a really tough journey to get his contact address and meet him in person, because the magazine titled COMIC ARE! (MAGAZINE HOUSE, Ltd.), which the Manga was serialized in, was no longer being published at that time. I am happy that Mr. Katabuchi and Mr. Yuasa have become big names as animation directors, which led to the two films we developed could have opportunities to be highly praised and acclaimed anew as their first featured films. Hideki Nagaishi: Did you have any criteria in finding and determining people such as Mr. Katabuchi and Mr. Yuasa to promote to directors of featured films, at that time? Eiko Tanaka: That kind of young talent tends to glitter in the Japanese animation industry. That is the case with Mr. Katabuchi and Mr. Yuasa. And young talent is becoming a topic of conversation during the people in the industry like, “That part in that title is Mr. Yuasa’s work. That is so good!” So, I extended my antenna to catch those kinds of comments. Regarding to Mr. Yuasa, he worked with STUDIO 4°C for Noiseman Sound Insect (1997), a short film directed by Koji Morimoto before the Mind Game project. Among the main characters of the short film, we asked Mr. Yuasa to direct the character Noiseman, and the other boys were directed by Mr. Morimoto. We tried a unique development approach: Mr. Yuasa drew the storyboards of all the scenes in the film which Noiseman appears, and Mr. Morimoto drew the storyboards of all other characters in the film. It was just around the time computer-generated visuals were introduced in the Japanese animation industry, and we were also trying to do many new challenges with the new development team of the short. Through those challenges, I could learn more about him, such as: “Oh, Mr. Yuasa has this great talent and comes up with such interesting or attractive or fun things!” Those things about him lead me to think of asking him to direct his first animated feature. Eiko Tanaka: STUDIO 4°C wants to continually bring up potential young talents, one after the other, and hope that they graduate this studio as mature directors in the end. So, we have been trying to make excellent young creators gain experience by, for example, asking them to direct the CGI, and after that, make them draw storyboards of about 20 minutes for a TV series, then we prepare an opportunity for them to take on the challenge of staging for a feature film as an assistant director. Animation could be made only through teamwork, so it is important to learn how to develop a team and work together with the team for making the animation they want, in order to set up their careers. It is not what we intended to do from the beginning, but I noticed that STUDIO 4°C has made many animated shorts, and young creators could experience the whole development process of animation, including the use of sound, by directing shorts. I think that making short films helps us for training new talents.